Usually by this time of year the hill climb event I put on, Feel My Legs, I’m a Racer, is already scheduled. Or may have already happened! This year I am pushing it to late summer or maybe even early Fall. I apologize for the delay, but a few things have prevented it from happening as normal. Don’t worry though, it will go on. Also, I’m starting to prepare for 2015, which will celebrate the 10-year anniversary of this event! Hope to do a few extra things next year to really celebrate. Can you believe it has been that long? Long live #BikeLA. 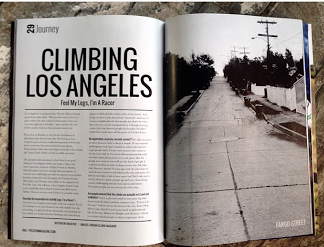 Meanwhile, I was very fortunate to have Peloton Magazine cover it as part of their issue on climbing. It includes wonderful photos from my friend Jordan Clark Haggard, some of which you can see at this link, below the excellent photos of my friend Megan Dean of Moth Attack Custom Bicycles. Thanks Jordan and everyone at Peloton! Also in the issue is my very good friend Steevo. We rode the Great Divide mountain bike route together in 2007 (more famous for the Tour Divide race that uses the route). We’ve been friends for 20 years and bikes have been a part of that equation ever since. He’s the 10x winner of Danny Chew’s Dirty Dozen hill race in Pittsburgh, which my event is based on. More interesting than that are the stories on his blog, which you should definitely check out. When I schedule this year’s event I will post here on this site and on my twitter, @MattRuscigno. 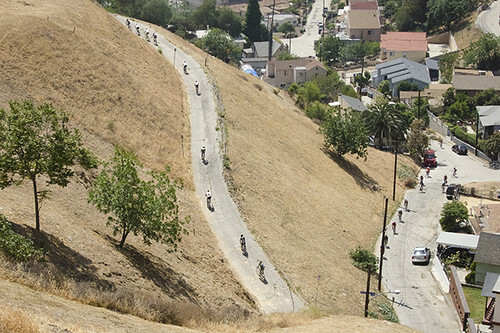 A lot has changed in the Los Angeles bike world since I first held this event in 2006! Urban riders have become racers with regularity, racers have found the benefits of riding in the city and unsanctioned bike races are the norm. What I love is that these were the original goals of my bike club, Swarm!, way back in 2005 when we put a name to what we are doing- blurring the line between being a commuter and a racer and adding DIY ethics to everything. Bikes are more than exercise machines- they are a medium for exploring the world! Putting yourself on a bike in a city is still an act of rebellion. With that said I present to you the 2013 Feel My Legs, I’m a Racer. 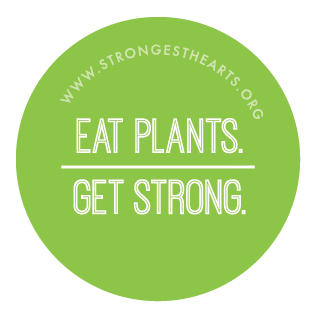 Sunday April 28th 745am at 3626 W Sunset Blvd / Sunset Triangle Park in Silver Lake. Rider meeting at 810am, roll to first hill at 815. Please be on time! See other FAQ on this earlier post and entire event history here. Last year’s info and ride report are fairly comprehensive. It’s a facebook event too. I may need some more day-of volunteers, please let me know if you can help out. Thank you! 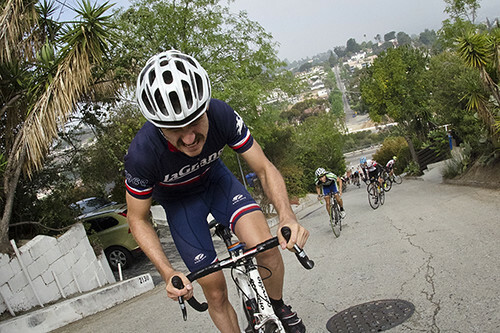 This is a stage ‘race’ on 10 of the hardest hills in Los Angeles that started in 2006. We ride as a group between hills and then each hill is its own event with points awarded for 1st through 5th. We regroup and ride together to the next hill. The rider with the most points after 10 hills wins! It’s based on Danny Chew’s Dirty Dozen. 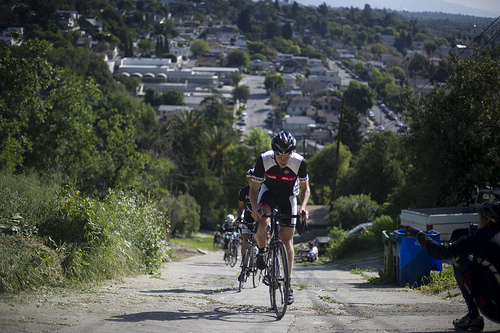 Most riders are out there just to ride all 10 hills in one day, which is no small feat. 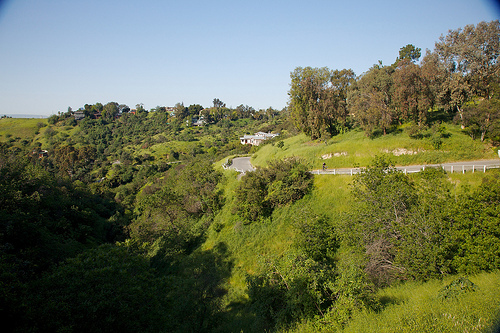 It’s also a fun tour of hidden roads in Los Angeles. And strava data is available. Definitely not! Most people on this ride are not racing, but are there just to ride up single every hill, which is a huge endeavor on its own. You can try! We ride together from hill to hill and any gear that you could get up these hills with will be too low to stay with the group. You are welcome to come out and prove me wrong though. No automobile support to drive your bike around. I don’t care if you are the Messenger World Champion of the World. Using a flip flop hub is okay. Probably not. We ride as a group from hill to hill at a chill pace. At each hill it will be obvious where to go. At any turns or confusing parts I’ll try to have chalk or a volunteer. We regroup at the top only after the last person has made it up. Either way, please familiarize yourself with the hills and the route. Climb. A lot. Also check out all of the hills beforehand and learn the areas we ride through. A good gauge is Micheltorena off of Sunset Blvd. It’s long with steep sections and if you can make it up that comfortably I think you can hang on this ride. Another test is Fargo St, which is a monster of a hill. Most people who come out way underestimate how hard this is. Which is why more than half who start don’t finish. I wish. 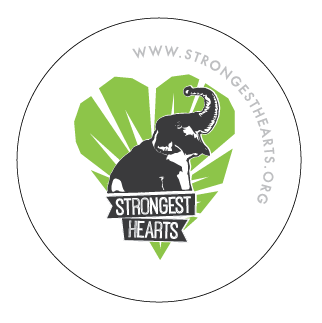 In the past we’ve done everything from pancake breakfasts to picnics and from t-shirts to patches, all for a free event! I’m not sure we’ll be doing any of those in 2013, but I’ll see what I can do. My bike club, known as Swarm!. We ride everything from alleycats to international UCI races. Collectively we think that the world would be a better place if people rode bikes and ate vegan food more often. My friends want to watch, can they drive along the course and stop at the hills? Absolutely not. We’re going to be on narrow roads in quiet neighborhoods; I don’t want to add to the car traffic. 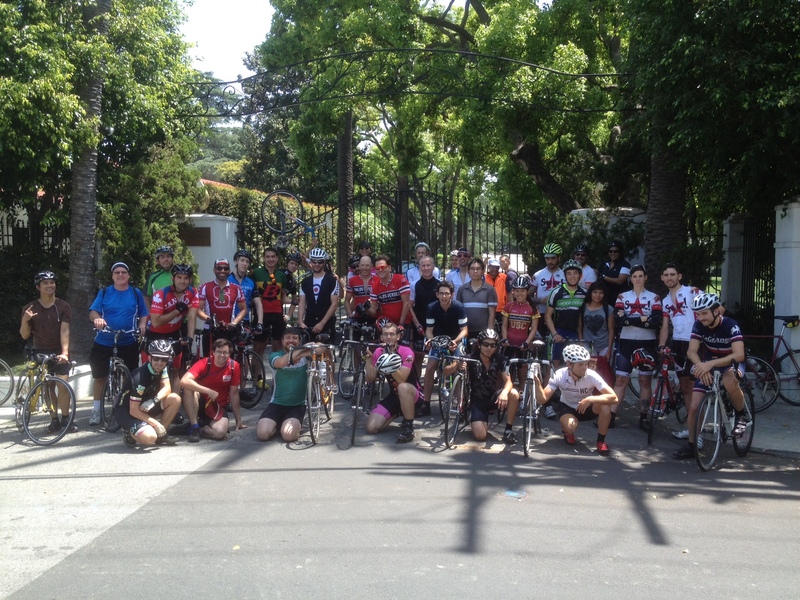 They are welcome to ride bikes along with us and I’ll help navigate the best places to see and how to get around. By the end almost half the people with us are just there to watch and cheer on the other riders! Again, no cars. I will ask you to leave. If multiple people cannot abide by this I will simply cancel this and ride away. Plan to be done around 2pm, hopefully sooner. Thanks for asking! I need help getting the word out. Please send this page to your bike club/crew/gang. I also may need some volunteers the day of. Getting up and down the hill may or may not be required. Photography is always appreciated, but again, by bike, not car. 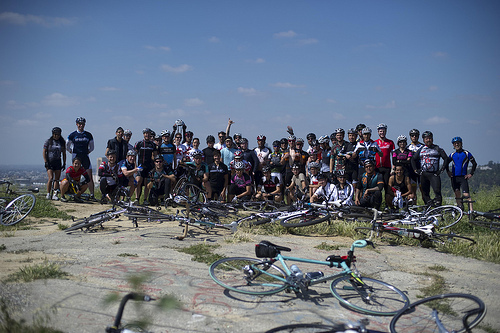 Get in touch at bikeswarm [at] gmail. Thank you for your interest and I hope to see you at Sunset Triangle Park on Sunday the 28th!